TUSCOLA — The Bulldogs lost to the Jim Ned Indians 34-57 in their second match up of the season Friday. Senior Gage Clark-Burdell had a game high of 26 points to lead the Bulldogs at the scoreboard. He also netted a three-point goal in the second quarter. Clark-Burdell accounted for 13 of 14 points scored in the second which was the best quarter of play for Coahoma. Thanks to Clark-Burdell’s efforts, the Bulldogs headed to the locker room at halftime down by only 7 points. However, the Indians (8-0) returned for the second half fired up to keep their district win streak alive and salted away the game by dominating the third quarter. Next: The Bulldogs (3-4) host the Stanton Buffaloes for their second round of District 5-3A play Tuesday. Coahoma continues to stay in the running for a play-off bid. The game is set to begin at 8 p.m. in the CES competition gym. 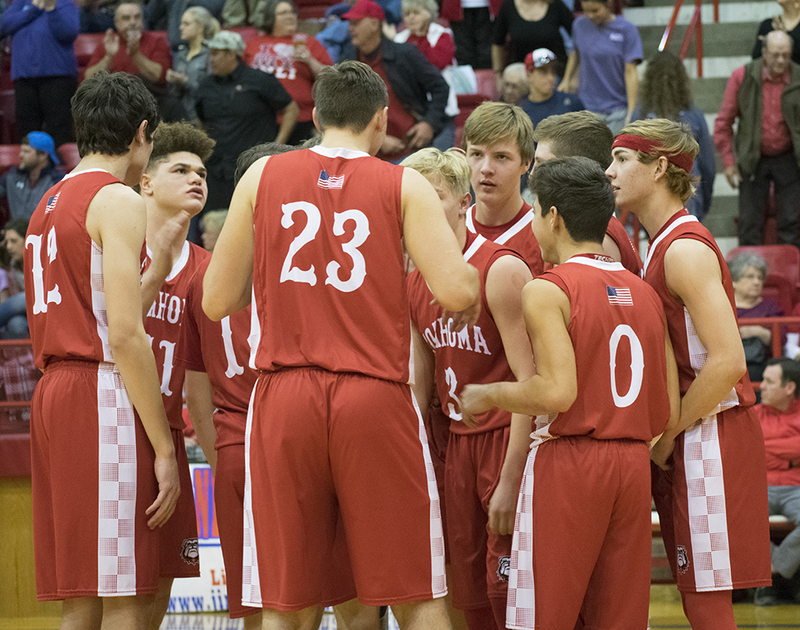 JV Red will play at 5:15 p.m. in the competition gym and JV White will begin play at 6:30 p.m. in the high school gym. Coahoma — Brice Martin 1, Zack Schneider 2, Bryson Cline 5, Gage Clark-Burdell 26. Jim Ned — Ethan Senne 13, Cade Ford 11, Caden Burke 5, Dylan Bryant 20, Matt Stewart 4, Kade Kimmel 4. Free Throws — Coahoma 7-12, Jim Ned 3-6 ; Three-Point Goals — Coahoma 1 (Clark-Burdell), Jim Ned 6 (Ford 3, Seene 2, Burke); Total Fouls — Coahoma 7, Jim Ned 18. TUSCOLA — The Bulldogettes fell to the No. 6-ranked Jim Ned Lady Indians Friday, 15-56. 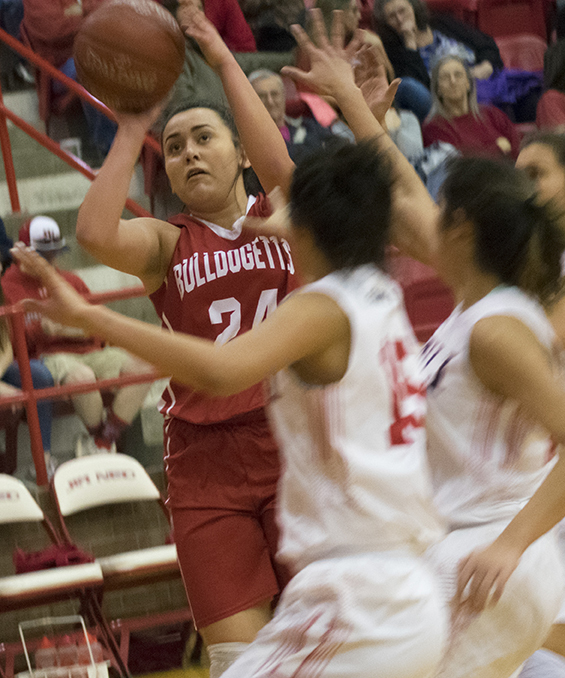 The Lady Indians improved their District 5-3A win streak to 10 by scoring in the double digits all four quarters of the game while Coahoma was held to single digits. Caitlyn Corley led the Bulldogettes at the scoreboard with 6 points. Abbie Lopez netted a three-point shot in the fourth. Next: The Bulldogettes face the Stanton Lady Buffs at home Tuesday. Game time is set at 6:30 p.m. at the CES competition gym. The JV team will play at 4 p.m.
Coahoma — Caitlyn Corley 6, Madison Rogers 2, Abbie Lopez 5, Julia Cortez 2. Benton — Taylor Benton 7, Jenna Moore 8, Espinosa 4, Carter Gomez 2, Libby Tutt 10, Leticia Salas 2, Claire Graham 7, Brooke Galvin 6, Malone Graham 10. Free Throws — Coahoma 2-2 , Jim Ned 7-11; Three-Point Goals — Coahoma 1 (Lopez), Jim Ned 3 (Benton, Moore, M. Graham); Total Fouls — Coahoma 7, Jim Ned 3.